PSU Designer II is designed to help you with the design of simple linear (unregulated) mains power supplies, as often found in tube amplifiers. Rectifier types: Solid state, Vacuum tube types 5AR4, 5R4-G/GY/GYA/GYB, 5U4-G/GA/GB, 5V3-A, 5V4-G/GA, 5Y3-G/GA/GT, 5Z3, 6AU4-GT, 6AX4-GT/GTA/GTB, 6CA4, 6D22S, 6DE4, 6X4, 6X5/GT, 6W4-GT, 83, EZ80, EZ81, GZ33, GZ34, GZ37. Rectifier configurations: Half-wave, Full-wave, Full-wave bridge, Voltage Doubler. Filter configurations: Simple C filter, C/R/C, C/L/C and LC (swinging choke). ESR in capacitors can be catered for, as can winding resistance in chokes. Chain as many filters together as you like. Outputs: Graphic representation of voltages and currents present in the power supply. 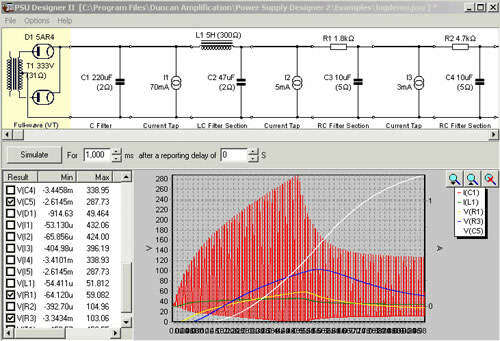 Tools/Utilities: Transformer off-load voltage calculator, transformer source impedance calculator. Other features: Online context sensitive help. Ability to add extra rectifier types. Operating system: Windows 95, Windows 98, Windows 2000 or Windows NT, XP, VISTA. ha, I am going to experiment my thought, your post bring me some good ideas, it’s really amazing, thanks. Thank you so much for writing all of the great information! I am looking forward to checking out more! The great article assited me very much! Bookmarked your blog, very excellent categories just about everywhere that I see here! I really appreciate the information, thank you. Thank you very much for posting all of the good info! I am looking forward to reading more! 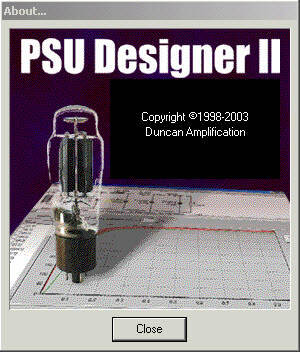 Since this is very informative, I took the time to bookmark http://www.electronicecircuits.com/electronic-software/tube-amplifier-power-supply-unit-designer/ on Digg.com. I figured the title – Tube Amplifier Power Supply Unit Designer – was best to use for people to find this info, so that is what I used. thank you very much for posting… thanks. this is important to my idea.